Radon is an odorless, tasteless and invisible gas produced by the decay of naturally occurring uranium in soil and water. Radon is a form of ionizing radiation and a proven carcinogen. Radon can be found all over the U.S. It can get into any type of building – homes, offices, and schools – and result in a high indoor radon level. But you and your family are most likely to get your greatest exposure at home, where you spend most of your time. Testing is the only way to know if you and your family are at risk from radon. EPA and the Surgeon General recommend testing all homes below the third floor for radon. EPA also recommends testing in schools. Fix your home if your radon level is 4 pico-Curies per liter (pCi/L) or higher. Radon is measured in pico-Curies per liter of air ( pCi/L ), a standard unit used across the work for radiation to measure the number of decays (radioactive explosions) that occur within 1 liter of air every 60 second. 1 pCi/L equals 2.2 radioactive explosions every minute in every liter of air. That doesn't sound like much until you consider the amount of air within a house. For example, a 1,000 square foot home with 4pCi/L will have about 2 million explosions occurring in that house every single minute of every day. If you could see the explosions as they occurred there is no doubt everyone that has a radon problem would have it fixed. The half-life of radium is relatively stable at 1,622 years but the half-life of radon is only 3.82 days. Worse yet, is the half-life of radon decay products, which explode at even faster rates, repeatedly strike our cells with radiation. It is actually radon decay products that cause the damage, not radon, but we still test for radon because it easier to measure. Time exposed to multiplied by the amount of radiation, equals dose. So living in a house with 1 pCi/L for 5 years is the same radiation exposure as living in a house with 5 pCi/L for 1 year. Same amount of radiation exposure in both cases. Just like the standing next to a nuclear poser plant for 2 hours is twice as bad as standing there for 1 hour. So, either lower the amount of radon your family is exposed to or the amount of time exposed and it will immediately begin to effect your past exposure while also protecting your family in the future. Be sure to also test anywhere you or a family member spends a lot of time like at work, school, child care, etc. If you are fortunate to have a home that measures between 1.3 pCi/L to 1.5 pCi/L then your home is considered average. Combine this with all other forms of radiation that your family is exposed to and radon will still account for more than 50% of your families total radiation exposure over the lifetime, even at that low of a dose. 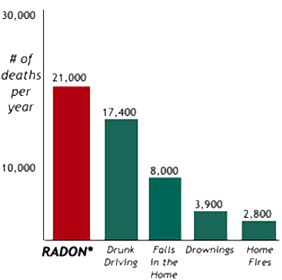 Radon is the single greatest contributor of radiation to the average person and remember, less is better. Radon gas decays into radioactive particles that can get trapped in your lungs when you breathe. As they break down further, these particles release small bursts of energy. This can damage lung tissue and lead to lung cancer over the course of your lifetime. 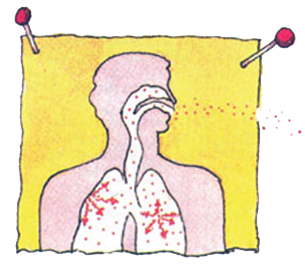 Not everyone exposed to elevated levels of radon will develop lung cancer. And the amount of time between exposure and the onset of the disease may be many years. Like other environmental pollutants, there is some uncertainty about the magnitude of radon health risks. However, we know more about radon risks than risks from most other cancer-causing substances. This is because estimates of radon risks are based on studies of cancer in humans. Radon is estimated to cause many thousands of deaths each year. That's because when you breathe air containing radon, you can get lung cancer. In fact, the Surgeon General has warned that radon is the second leading cause of lung cancer in the United States today. Only smoking causes more lung cancer deaths. lung cancer deaths in the U.S. each year. Any home may have a radon problem. Radon is a radioactive gas. It comes from the natural decay of uranium that is found in nearly all soils. It typically moves up through the ground to the air above and into your home through cracks and other holes in the foundation. 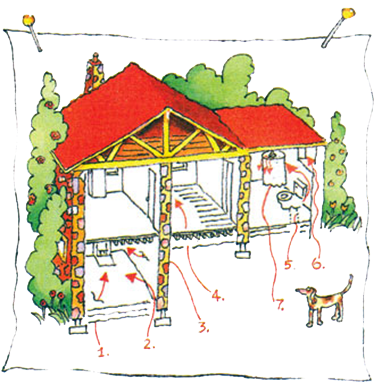 Your home traps radon inside, where it can build up. Any home may have a radon problem. This means new and old homes, well-sealed and drafty homes, and homes with or without basements. Radon from soil gas is the main cause of radon problems. In a small number of homes, the building materials can give off radon, too. However, building materials rarely cause radon problems by themselves. Since there is no known safe level of radon, there can always be some risk. But the risk can be reduced by lowering the radon level in your home. There are several proven methods to reduce radon in your home, but the one primarily used is a vent pipe system and fan, which pulls radon from beneath the house and vents it to the outside. 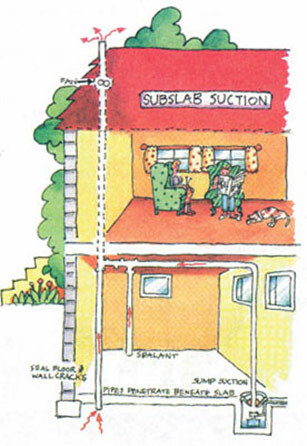 This system, known as a soil suction radon reduction system, does not require major changes to your home. Sealing foundation cracks and other openings makes this kind of system more effective and cost-efficient. Similar systems can also be installed in houses with crawl spaces. Radon contractors can use other methods that may also work in your home. The right system depends on the design of your home and other factors. The cost of reducing radon in your home depends on how your home was built and the extent of the radon problem. Most homes can be fixed for about the same cost as other common home repairs. The cost to fix can vary widely; Lowering high radon levels requires technical knowledge and special skills and you should only use certified Radon Mitigation Contractors to fix the problem.